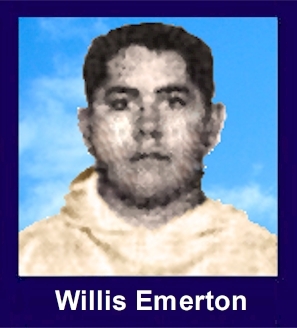 The 35th Infantry Regiment Association salutes our fallen brother, PFC Willis Wayne Emerton, who died in the service of his country on October 9th, 1967 in Quang Tin Province, Vietnam. The cause of death was listed as Small Arms/AW. At the time of his death Willis was 21 years of age. He was from Dallas, Texas. The decorations earned by PFC Willis Wayne Emerton include: the Combat Infantryman Badge, the Bronze Star with V, the Purple Heart, the National Defense Service Medal, the Vietnam Service Medal, the Vietnam Campaign Medal and the Vietnam Cross of Gallantry with Palm Unit Citation. The following obituary appeared in the Dallas Morning News in the October 16, 1967 edition on page 4D. Sp. 4 W. Wayne,1940 Mayflower. Survived by wife, Mrs. Rhonda Emerton; parents, Mr. and Mrs. Joe H Emerton; brothers, Tom, Bill and Paul Emerton; sisters, Mrs. Betty McNeeley, Mrs. Floy Rener, Mrs. Catherine Moore, Mrs. Imogene Spears, Mrs. Sue Leake, Mrs. Ann Lynch, Mrs. Janice Gates. Chapel services 10 am Tuesday , Reverend Henry Lawson officiating. Interment Laurel Land. Pallbearers Charles Forbes, John Wofford, Tom Snodgress, Mike Grimes, Hunter Fisher, Jim Gauldin. Dudley M. Hughes Funeral Home 400 East Jefferson. For heroism in connection with military operations against an armed hostile force in the Republic of Vietnam. On 9 October 1967 Private First Class Emerton distinguished himself while serving as a Rifleman in A, 1/35th Infantry; engaged in a search and destroy operation near FSB Mary Lou. Private First Class Emerton's platoon was approaching a suspected enemy concentration when it began receiving fire from an NVA force entrenched in concealed positions. He noticed that one man who had been wounded had fallen in an open area and was exposed to hostile fire. Private First Class Emerton rushed forward through the intense enemy fire and, with the help of another man, carried his wounded comrade back to a covered position. He then went back to rescue another wounded man, but his heroic efforts were cut short when he was mortally wounded. His courage in the face of enemy inspired other members of the platoon to complete the rescue. Private First Class Emerton's heroic and unselfish actions are in keeping with the highest traditions of the military service and reflect great credit upon himself, his unit, and the United States Army.